Can we talk about how funny this is? This is a real thing on the CDC's website. 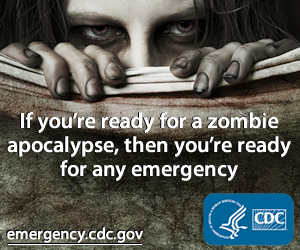 Ok, it's not actually about a zombie apocalypse, it's about general emergency preparedness, but I just love that someone over there has the sense of humor to write and post this on their official site. Ok, study break is over. Happy Thursday! Photo Contest - Please Vote! !